Smith & Wesson’s SW423B Oasis is a robust liner lock knife. This is Smith and Wesson Knives’ bread and butter; a no frills, rock solid folding knife done right at a price anyone can afford. The entire knife is made of Black Titanium coated stainless steel. The handle is of a pillar-frame construction, making the knife both lightweight, and easy to clean. There is also a nice pocket clip for tip down carry and a lanyard hole. The blade itself is 3.2″ long, made of 440C stainless steel and has a plain edge on a drop point style blade. This is my favorite blade shape and I much prefer a plain edge over a combo edge, especially for every day carry (EDC) where I see this knife getting the most use. This is a good size EDC knife, for some it might be a little large but I think 3.2″ is well within a normal EDC carry size. Speaking of which, the closed knife measures 4.3″ and weighs 4.8oz. No doubt some of this weight is due to the all steel design, but Smith and Wesson has taken measures to cut down on that with the pillar-frame construction and the skeletonized handles. The knife has a solid linerlock which should be more than adequate for EDC tasks. The knife snaps open easily and locks up tight. 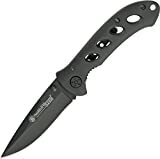 This is a very popular knife and a lot of people like it, thanks in large part to its modest price.